Global Financialisation and Disability: Can Disability Budgeting be an Effective Response in the South? This chapter explores a southern disabled standpoint as a theoretical and strategic approach to examine disability with the intensification of global financialisation. The 2008 financial crisis was a significant illustration of the fragility of deregulated financial markets which directly impacted on advances in addressing issues of poverty, particularly for people with disabilities in the global South. 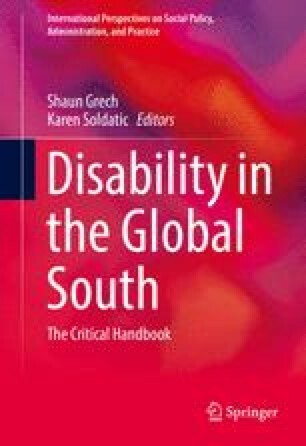 By locating the 2008 crisis within neo-liberal strategies of financial deregulation launched in the mid-1990s, this chapter examines how the normalisation of financialisation mechanisms, processes and practices reproduces the marginalisation and exploitation of people with disabilities in the global South. In particular, we illuminate new forms of colonialism by highlighting how global finance capital located in the global North increasingly influences the development landscape. To conclude, we explore the increasing role of identity budgeting, as first articulated in Sao Paolo through local women’s movements as ‘gender budgeting’, as a counteracting southern tool of social justice. The global inequality crisis is reaching new extremes. The richest 1 % now have more wealth than the rest of the world combined. Power and privilege is being used to skew the economic system to increase the gap between the richest and the rest. A global network of tax havens further enables the richest individuals to hide $7.6 trillion. The fight against poverty will not be won until the inequality crisis is tackled. Chaudhry, V. (2016). Living at the edge: Disability, gender, and neoliberal debtscapes of microfinance in India. Affilia. doi: 10.1177/0886109915622525. Rosset, P. & Gerber, K. (2014). Gender public policy evaluation for Brazil: Diagnosis and prospects, towards constitutional desired equality. Retrieved from https://www.jus.uio.no/english/research/news-and-events/events/conferences/2014/wccl-cmdc/wccl/papers/ws4/w4-rosset&gerber.pdf. Sen, A. (2015). The economic consequences of austerity. New Statesman [online] Available at: http://www.newstatesman.com/politics/06/amartya-sen-economic-consequences-austerity [Accessed 25 Sept.2015]. United Nations. (2006). Convention on the rights of persons with disabilities. Retrieved from http://www.un.org/disabilities/default.asp?id=264.